TUGboat, Volume 34 (2013), No. 2. 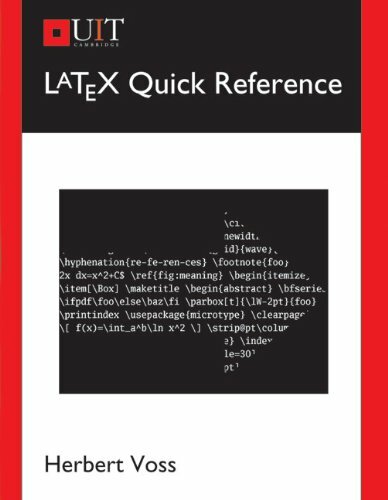 Herbert Voß, LaTeX Quick Reference. UIT Cambridge, 2011. vi+234 pp. Paperback, US$29.95. ISBN 9781906860219. A bookcase in my home is filled with dictionaries and reference books. Several times I promised myself to stop buying them: they take up too much space, and it is much easier to look up a definition on the Internet or in an electronic book using search functions. Still I just cannot resist. Thus if Herbert had not given me a copy of this book at the last TeX Users Group meeting, I probably would have ended up buying it anyway: this book is a perfect addition for this bookcase. The author warns the readers this is not an introduction to LaTeX: you cannot use it for self-learning or as a textbook for LaTeX. Rather, it is a reference book. The difference between a textbook and a reference is the organization of material. In a textbook the topics are introduced in a pedagogical order. A reference book puts the material in the order which is easy to look it up. This is the difference between a phrase book with the chapters like “In a restaurant”, “On a bus” etc., and a dictionary with chapters “A”, “B”, “C”, etc. While alphabetical order is natural for a dictionary (at least for alphabetic scripts), it is not so for reference books about computer languages like LaTeX. If the commands are explained alphabetically, then to find the command, say, \DeclareSymbolFont, I need first to know its spelling. However, when I need the information I usually do not know the spelling—or even whether such command exists. I probably have just a vague understanding of the task, for example, ‘I want to use the symbols from another font for my math’. Getting the name of the command may be the result of my query rather than its start. Therefore most reference books about TeX or LaTeX assume the logical order of organization. For example, Victor Eijkhout’s TeX by Topic has chapters like Characters, Boxes, Grouping, Spacing, etc. The LaTeX Companion by Mittelbach, Goossens, et al., has chapters like The Layout of the Page, Fonts and Encodings, Mastering Floats, etc. Unfortunately, LaTeX Quick Reference uses alphabetical order for most of its chapters. choosing simplicity over meaningful context. For example, pages 16–22 are occupied by a long list of all document classes currently existing on CTAN accompanied with one-line descriptions, sometimes rather cryptic; e.g. qcm is described as multiple choice. Another chapter is devoted to LaTeX commands; it consists of three lists, Environments (pp. 41–46), Commands (pp. 46–67) and Special Commands (pp. 67–70). Another chapter has lists of all counters and lengths in core LaTeX. The entries in the lists are short—sometimes too short. A chapter about fonts has a list of fonts with samples (I liked this list the most simply because I love to study font shapes). Besides these chapters, reminding one of Umberto Eco’s The Infinity of Lists, there are some less dry ones, much better written. There is a chapter about TeX binaries with a description of useful auxiliary programs like pdfcrop, rarely discussed in TeX books. There is a chapter about several selected packages such as hyperref or xcolor with a nice introduction to these packages. There is a chapter about BibTeX and the newer alternative biblatex. Even in these chapters one finds long alphabetical lists (for instance, four pages of hyperref options and six pages of bst files), but also finds a useful discussion, covering topics usually not explained elsewhere. These chapters alone probably can justify buying the book. The book is nicely typeset, printed and bound—although the margins might be a little more generous. In conclusion, I can imagine a reader thumbing through the book, stopping at an interesting passage or enjoying a font sample. It is less clear to me how to use the book as a reference due to the way the material is organized. Maybe an electronic version of the book with the possibility of full text search would be a better idea. Otherwise I would much prefer a logical grouping of the topics.